When children learn to speak, they immediately begin using the nine parts of speech without realizing it. Soon, children learn to identify each of the parts of speech. Learning does not have to be boring. 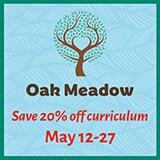 Hands-on, active lessons are best for engaging the child and for memory retention. Below are five fun activities to teach the parts of speech. 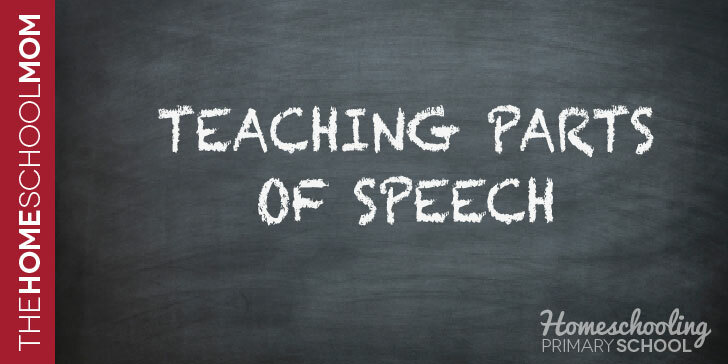 Before participating in any of the activities, review the following parts of speech with your student. Colorful Copywork Grammar: Have your child copy down a few sentences. Allow your child to either underline the different parts of speech in different colors or write the words of the sentence in different colors to represent the parts of speech. Ping Pong Grammar: Write words with a black permanent marker on ping pong balls, then place paper bags or buckets on one side of the room. Mark each paper bag or bucket with one of the parts of speech. The child must stand across from the buckets or bags and toss the ping pong ball into the bag that correlates with the word written on the ball. Parts of Speech Charades: Write down a variety of words, phrases or sentences using nouns, verbs, and adjectives, on index cards. (example: “The angry man ran.”) Place the cards in a hat or bag. Draw a card and without anyone seeing and read it. Now act out what the card says. Parts of Speech Scavenger Hunt: Read a book together and challenge your child to pick out as many parts of speech as possible. You can mix things up by asking for verbs that end in “ing” or adjectives that are colors, or nouns that begin with the letter “s”. Grammar Ball: Sit in a circle or across from one another if there are only two players. Name one of the parts of speech. The person with the ball says a word that correlates with that part of speech. Then he rolls the ball to the next person and that person says another word that correlates with that part of speech. 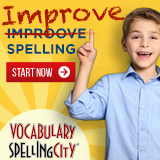 Once someone can no longer think of another word then it is time to start again with a new category. 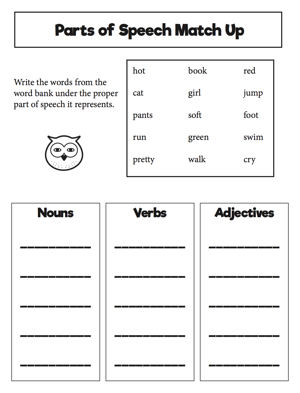 If your child enjoys worksheets, let him try this Parts of Speech Match Up. If she enjoys it, you could cut off the bottom and copy it for use with other word lists, pages from books, posters, etc. Richele is a homeschool mom and trained Orton-Gillingham tutor. Her interest in reading difficulties was inspired by her amazing and creative dyslexic daughter. You can visit Richele on her blog at Under the Golden Apple Tree. Excellent post 🙂 I LOVE your ideas…so creative. And, I so applaud hands-on learning–it just can’t be beat!